Tuscan Salon brings you innovative, highly personalized spa and salon services in a beautiful, spacious, Tuscan-inspired environment. We are conveniently located on Puyallup’s South Hill on the second floor of the Dairy Queen building. 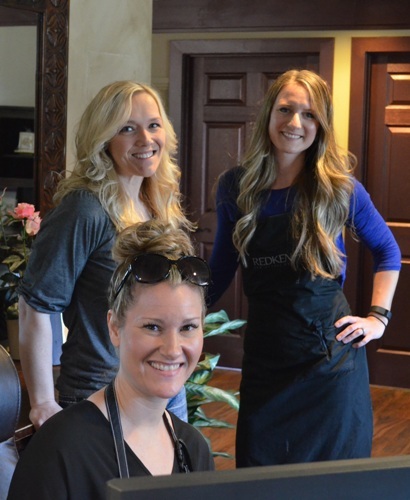 We strive to provide you excellent customer service as well as a full array of superb hair, body, skin, and nail services. Additionally, we offer top-quality products to help you achieve consistent, high-quality, in-home results. Our objective is to help you create, enhance, and optimize your internal and external beauty. Also, add a little pampering and fun, too! To cancel an appointment without charge, let us know at least 24 hours in advance. Any cancellation made within 24 hours of an appointment will result in a charge equal to 50% of the reserved service amount. A “NO SHOW” will also result in a charge equal to 50% of the reserved service amount. The cancellation policy allows us the time to inform our standby guests of any opening, therefore allowing us to provide the best service possible. With a valid receipt, an unused product can be returned for a full refund within 15 days of purchase or for exchange within 30 days of purchase. Children are only permitted in the salon area when having a service. For safety reasons and insurance purposes, no child under the age of 12 may accompany you while you are having a service, unless seated in the waiting area. We do not have the facilities to care for children. We love children, and we hope you understand, we cannot assure their safety in a professional environment. We also do not want to compromise the relaxation of our guests.